Le Domaine du Castel est un vignoble de référence dans le haut de gamme du Kosher Israélien dans laquelle il tient le haut du pavé. Cépages:Merlot, Petit Verdot, Cabernet-Franc, Malbec. Haute Judée. Parker 89. Note: Elégant, équilibré, épicé avec notes appuyées de fruits mûrs. Elevage en barrique (16 mois). Se marie avec pâtes, viandes, grill, fromages forts. Potentiel de garde à 2017. Servir à 17°C. 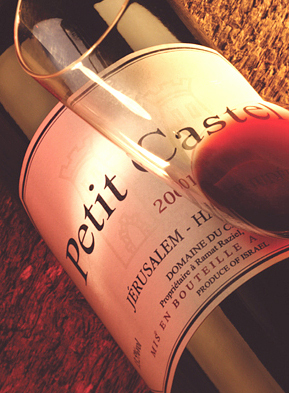 The 2007 PETIT CASTEL is on release the relative bargain in Castel’s otherwise pricey lineup-not that it’s cheap. On release, this bottling, which comes from the same vineyard, usually seems little different than the Grand Vin, the main difference being that it is usually not as well positioned for the longer haul. This is a touch herbaceous, tinged with green pepper and olives, elegant and gripping at the moment. The first attack, however, is impressive in its ability to deliver flavor and fruit. There isn’t a lot of depth here, but as between this and an older Grand Vin, there isn’t much to choose from at the moment. It should come around fairly quickly. Drink now-2017. 89/100 Points. Domaine du Castel-on everyone’s short list in the « Best of Israel » debate-is a boutique winery with a very French orientation. The reds are elegant Bordeaux ringers, and increasingly the Chardonnay resembles Burgundy. They are never the biggest or the most powerful, but they are always among the best crafted and most refined. Castel does need to be careful not to skimp too much on mid-palate concentration. On the whole, the wines have also shown remarkable consistency, granting that Israel’s vintages are more consistent than not. The next test is whether they can continue to develop in the cellar, getting better in time rather than merely holding. At this price level, that is a fair expectation. There is some evidence that this may happen in newer vintages, but there is still something to prove in that regard. Cette entrée a été publiée dans Domaine du Castel, Israël. Vous pouvez la mettre en favoris avec ce permalien.